After spending a fair bit of time speaking to a lot of my friends and ex-colleagues who either run e-commerce companies or work in them and providing honorary advice to quite a few, I have come to the stark realization that a lot of the good, "old world" analytics is not being fully utilized in the "new age" e-commerce companies. A simple case in point is the "recommendation engine". While the world is agog with praise for the beauty of the "recommendation engines" which based on the product that you select in your cart, comes up with a "basket" of associated, recommended products, we fail to realize and acknowledge that the buying behavior of an individual is not an instantaneous phenomenon. In my view, if the buying history of the person(wherever possible and if data is available through their profiles) is used in recommending products to the person and not purely on the basis of what he or she selects in the cart, then the click through rates and the conversion rates would increase dramatically. Many recommendation algorithms start by finding a group of customers whose purchased items overlap with the present user’s purchased items.The algorithm would then pick items from these similar customers, eliminate items the user has already purchased in that cart, and recommend the remaining items to the user. Collaborative filtering and some of the other algorithms used, focus on finding similar items as the end goal and hence, is a product-centric approach and not a customer-centric approach. Instead of this approach, if a customer centric approach is used, where a customer is offered recommendations based on the categories, brands and products that he typically buys, and is based on a DNA that is built based on his or her buying behavior over a long period of time and not that of other consumers, it is more likely to yield better results.This calls for a separate article on "how recommendation engines" can be made better and I will do that soon. Amazon, is calling it "anticipatory shipping", where historical data will be put to better use to drive customer sales and create customer delight. Though the packaging bit and the bit about keeping the shipments ready for delivery is a novel idea, the analytics behind it is not. Top analytics firms have been doing this for many of their clients for ages. For now though, with the above preamble and the somewhat necessary digression, I would like to redirect the reader's attention back to how data and analytics thereof, can be better used to run the day to day operations of e-commerce companies. The lowest hanging fruit and the easiest place to start is to create some handy dashboards and visualizations, that can equip the employees of an e-commerce firm to understand and measure their business and take informed decisions on the back of the insights that jump out of the dashboards. Let us look at the screen posted at the top of this article. We call it the "Insights" screen, which was developed for a medium scale e-tailer. While giving a high level summary of the key metrics like gross sales, number of orders, number of items, return rates etc. on a weekly basis, (you can filter for a particular category and/or a particular brand) it also provides drill down features at a state/city level( tool is customized to city level, upon request) to understand the dynamics at a geographic level. An effective operations manager would waste no time in identifying the top few states/cities and the bottom few states/cities in terms of sales performance and try and identify why it is so. He would probably allocate more resources to the states/cities that are high on cash-on-delivery kind of transactions. He would try and identify the states/cities with the highest returns and also identify the categories and brands that have the highest returns and take necessary follow up actions. He would de-list some brands and products from time to time, depending on their performance and quality.Furthermore, the category heads of the e-commerce company, would use this data to set targets for their sales teams. 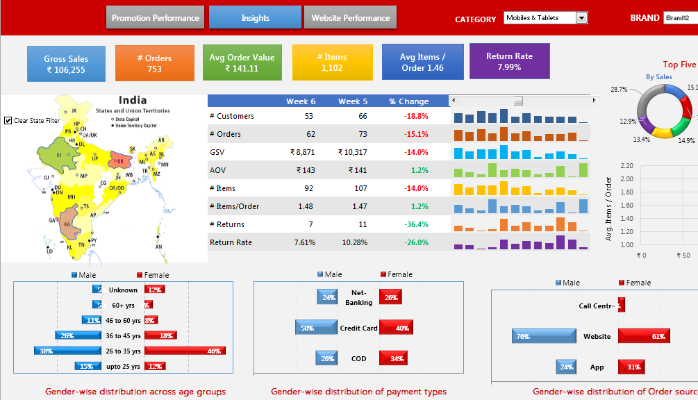 Let us now turn our attention to another key driver of sales for an e-commerce company- promotions.The screen below is called the "promotions performance screen" of the dashboard and is used by the marketing, the category and the brand teams to measure the effectiveness of the ongoing promotions. This dashboard helps the category and the brand managers decide on the type and kind of promotions to run, based on insights. For example, promotions for some brands/categories work far better on the web than through an app and vice versa, budget utilization of promotions is very high in certain geographies as compared to others,some promotions are best run for a couple of weeks( after which their performance tapers off) , while promotion periods for some other brands and categories could have an optimal length of 4 weeks. If for some promotions, most customers were lost even before they clicked on it, it means that either the placement or the creative of the ad needs to be improved. Run that same promotion with a better creative and a better placement and see if it improves results. Watch out for seasonality. Buying inventory ahead of the peak periods will help in better fulfillment and lower cost of goods( in peak periods sales blow through the roof and the cost of procurement is also high). If you have created customer segments using the historical data, then you can use this dashboard to figure out which type of promotions are working best for which customer segments and hence, use that learning in future promotions. Thus the companies can evolve into segment based targeting which can drive sales up significantly. I am yet to see a relevant and personalized email or sms from any of the e-commerce companies in India. This is a huge area of untapped opportunity and a tried and tested method of boosting sales. E-commerce companies need to grow beyond mass media advertising and try and grow their share of wallet from their existing customers, rather than focus purely on new customer acquisition. They need to take the best of learnings from the world of "brick and mortar retail" and apply it in their world. Many e-commerce companies that have now hit a purple patch seem to be ignoring their websites. They are no longer actively monitoring the performance of their websites nor bringing in innovation to aid in customer delight.They are probably far busier with their day to day issues, to pay attention to this aspect. But the website remains their key customer facing interface and nothing could be more important than studying it closely. In my next article I will dwell at length on how the "website performance" dashboard can be used to drive insights that will aid in improving customer satisfaction.